Do recipients of your emails complain about a mysterious attachment called winmail.dat which they cannot open? Do files you attach to emails disappear in that winmail.dat abyss? Does winmail.dat show up for some but not all recipients of your messages? Fortunately, you can get rid of winmail.dat altogether by making sure Outlook does not send mail using RTF. If Outlook sends a message using the RTF format for bold text and other text enhancements, it includes the formatting commands in a winmail.dat file. Receiving email clients that do not understand this code display it as an attachment. Outlook may also pack other file attachments in the winmail.dat file. In the Compose messages section, select the Compose messages in this format dropdown arrow and choose either HTML or Plain Text. In the Message format section, select the When sending messages in Rich Text format to Internet recipients dropdown arrow and choose either Convert to HTML format or Convert to Plain Text format. Under Compose in this message format, choose either HTML or Plain Text. The standard settings for outgoing mail formats in Outlook can be overridden for an individual email address. If a recipient still receives a winmail.dat attachment after you have made the settings changes, reset the format for individual addresses. Make sure the email address is not in your Outlook Contacts. Outlook 2019 and 2016 currently offer no way to change sending preferences for email addresses that are assigned to an address book entry. Open an email from the desired email address or start a new message to it. Under Internet format, select Send Plain text only. Search for the desired contact in your Outlook Contacts. Double-click the contact's email address or right-click the desired email address, then select either Open Outlook Properties or Outlook Properties. Under Internet format, select either Let Outlook decide the best sending format or Send Plain Text only. 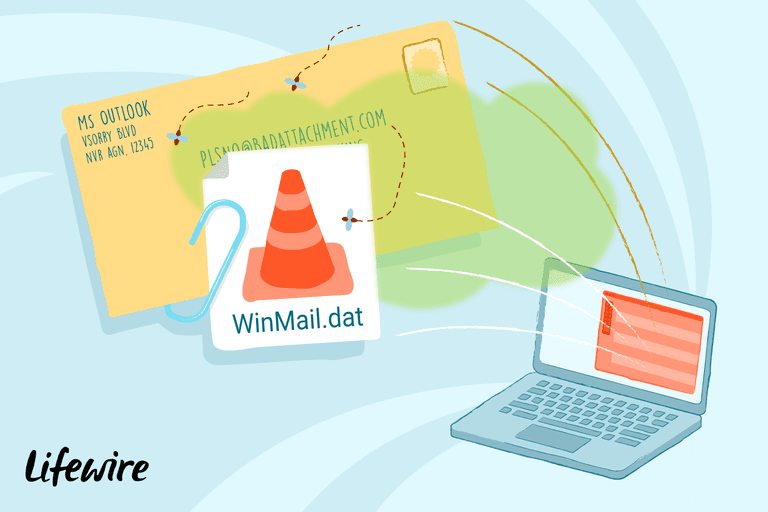 If you receive winmail.dat attachments with embedded files, extract them using a winmail.dat decoder on Windows or OS X.